In 1947, the academician D.J. Enright wrote a scathing indictment of the leading poetry magazine at the time, Poetry London. 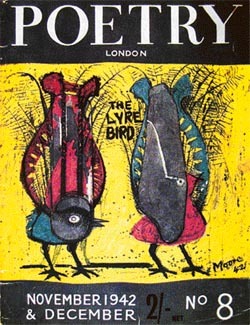 Founded in 1939 by Tambimuttu, Poetry London established the reputations of many poets of the 1940s, and famously published a "Poets in Uniform" number in 1941, which included the work of George Barker, G.S. Fraser, David Gascoyne, and Alun Lewis. Since 1939 (in February of which year the magazine Poetry London was inaugurated) something, it would seem, has happened to poetry. To suggest another aspect of the problem we might vary the proposition and say that since 1939 very little of any permanent value has happened in poetry. Never before have poets sprung up so thickly, never before has publication (given the right contacts) been so easybut hardly ever before has accepted and recognized work shown such a striking uniformity of weakness. The question before us now is: Has the latter fact any connexion with the former facts? Can it, even, be a case of effect and causes? There really ought to be a society for the prevention of cruelty to metaphors. These Poetry London poets flog their overworked metaphors mercilessly, force them into the most unnatural postures, pour gallon upon gallon of obscure pathos into them, until they burstinto bathos. This last comes from Blake Morrison's book, The Movement: English Poetry and Fiction of the 1950s (Oxford University Press, 1980, p. 34), which also provides this tantalizing quote: 'Enright exempted from his criticism only one Poetry London contributor, Henry Reed, whose "Lessons of the War" he admired because "too modest, or too wise, to attempt to deal directly with War"' [sic]. I had previously scanned the wartime issues of Poetry London, looking for an appearance by Reed, but came up empty handed. I'm not sure if Morrison is correct in calling Reed a "contributor" to the magazine, or if he simply inferred it from Enright's praise. The university library's holdings are incomplete, and they have since removed the entire run to Rare Books for safekeeping. The Critic published only two issues before it was absorbed into Politics & Letters, making it rather difficult to find. In 1955, D.J. Enright edited (and contributed to) a collection of Movement poets, Poets of the 1950s, comprised of work by Kingsley Amis, Robert Conquest, Donald Davie, John Holloway, Elizabeth Jennings, Philip Larkin, and John Wain. Blake Morrison would later provide Enright's obituary for The Guardian, in 2003.